In the Trumpian era, it’s hard to imagine that we need dystopian books, comics, and films since we all seem to be living in a dystopian nightmare and our Luke Skywalker-esque heroes are getting unceremoniously killed by bratty rebel spawns. 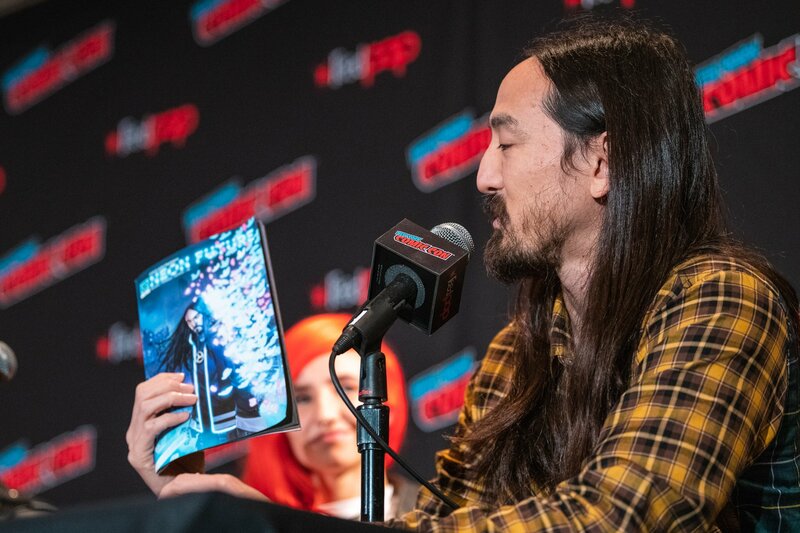 But Steve Aoki — DJ, entertainment industry magnate, and, now, comics creator — feels that now is just as good of a time as any to drop his Neon Future comic, which combines dystopian themes with elements from his new album, Neon Future III. Photo: Julian Cassady Photography“My obsession with mixing science and tech all started when I was a kid reading comic books. It took me on a ride to see how far the imagination can go, seeing ideas crossing the threshold from science fiction to fact,” said Aoki. “That’s the foundation of Neon Future where we’re headed as we evolve, our downfalls, our victories and breakthroughs to find a way to survive and thrive through it all.”Set 30 years in the future, America as we know it is now unrecognizable since advanced technology has been outlawed. (Whatever will the SoundCloud rappers do…) As a result, automation and artificial intelligence now reign supreme, and the masses of people who no longer have access to technology are unemployed. A civil war is brewing between the Augmented, an oppressed class of people who have chosen to integrate technology into their bodies, and the Authentic, who have not. The resistance movement Neon Future is led by the mysterious Kita Sovee (a character modeled after Aoki), who strives to bring peace by showing the world a brighter future in harmony with technology. 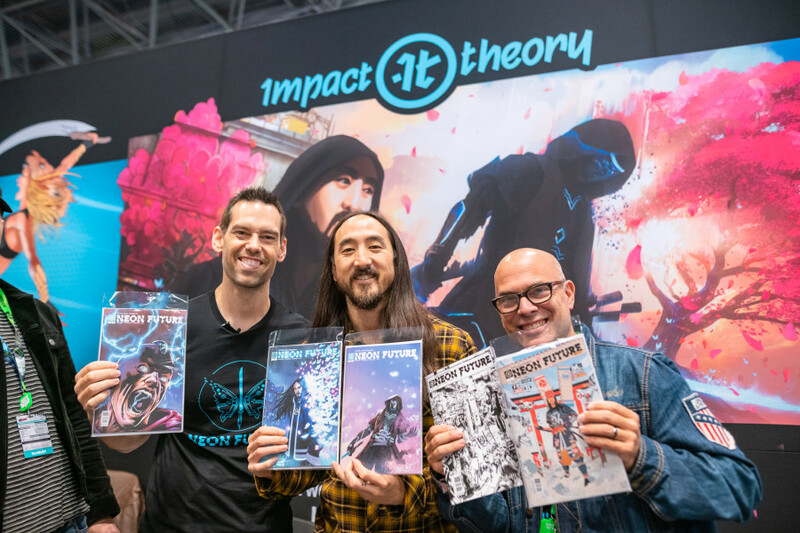 Photo: Julian Cassady PhotographyFor Impact Theory publisher Tom Bilyeu, the decision to pair with Aoki on this groundbreaking comic was an obvious one. “My goal with Impact Theory is to empower voices that otherwise aren’t empowered,” he said. “I want to give a voice to the voiceless — I want to give people, especially people who, in the past, didn’t have the opportunity to tell their stories in the comics medium because they aren’t white men, that chance to tell their story in an authentic way.”And Aoki upped the ante even further by commissioning Eisner Award-winning comics writer Jim Krueger (Mortal Kombat: Shaolin Monks, Justice for DC Comics, The Clock Maker), who used to be the creative director at Marvel Comics. “[Neon Future] has all the elements of a dynamic story, with compelling characters who evolve into true heroes by overcoming suffering. 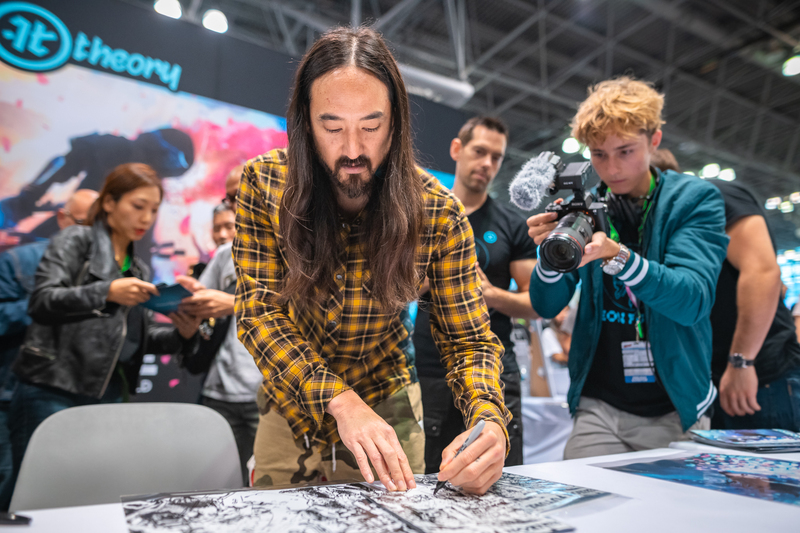 Working closely with Steve Aoki’s extraordinary imagination our team has built something really special,” he said. Photo: Julian Cassady PhotographyIt was this combination of award-winning writing and a unique storyline that sold Bilyeu — who first became famous when he co-founded the multi-billion dollar nutrition company, Quest Nutrition — on working with the DJ and multi-media star. “Impact Theory is a company that prides itself on impacting the culture,” he said. “Comics fans — the readers, the cosplayers, the creators of the comics culture — are some of the most loyal fans in existence. 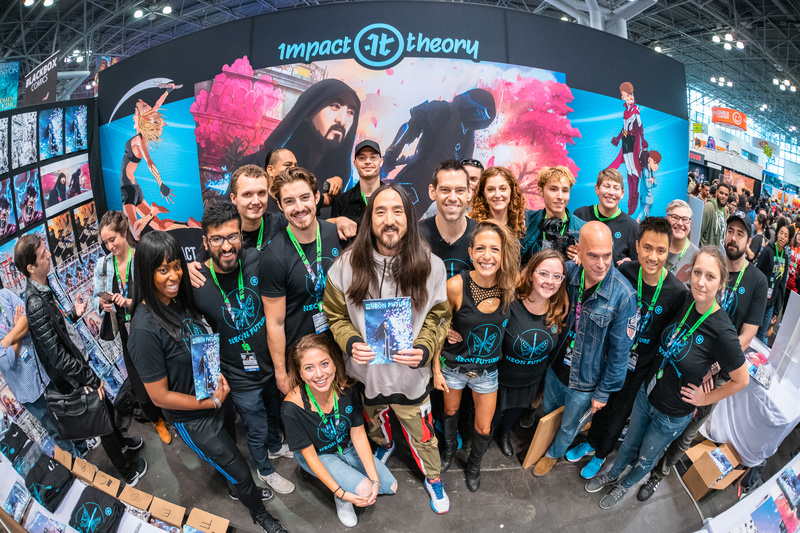 And we want nothing more than to tell an authentic story, from an authentic voice to authentic people.”Impact Theory certainly made a bold choice in premiering their comics at New York Comic Con. But while the convention was once seen as solely for purveyors and collectors of obscure DC and Marvel errata, and D-list celebrities from B-list movies charging $10 per autograph, today’s New York Comic Con is much more Hollywood driven, with stars from film, television, and music all shooting their shot in front of an audience that averages about 250,000 people in and out of the doors of the Javitz Center per day. Judging from the reaction of the countless fans, Aoki — and Impact Theory — seem to have done well. But this wasn’t surprising to the rising comics mastermind.